At Home Network, 2019. 03. 21. Easter in Eastern Europe is also a time of year when sunny days are back, flowers in bloom and days longer and warmer. Let's see the most common Easter traditions in Slovakia! Easter is a very popular holiday in Slovakia. They celebrate many traditions in the villages and make special meals. Many cities offer Easter markets with traditional goods and meals, where people can prepare for this holiday. Easter preparations usually start days before Easter. People go shopping and baking delicious traditional meals. 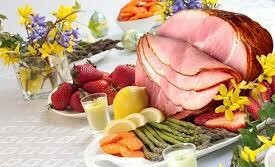 The festive meal is always the same: cooked ham, potato salad with mayonnaise, cold cuts, sandwiches, eggs and vegetables, but home made alcohol is also on the table. On Easter Monday men across Slovakia took buckets, filled them with ice-cold water and splashed the girls at their houses. They also spanked them with braided whips decorated with colourful ribbons that they call „korbáč”. In return, women gave something for men, for example decorated eggs, sweets, money, alcohol or cakes. People believed this brings beauty and health to the females. This tradition have been changed over the years, but sprinkling have remained very popular, just water bucket replaced with parfumes or a cup of water. In some villages, you may still see men, who loyal to the old traditions, dressed in traditional folk costumes and visit every house in the area. Easter in Slovakia is absolutely a great holiday and we have the opportunity to visit some events in the country like the walking tours we recommend below. Do you know what treasures hides the Primate’s Palace or the tower of St. Martin’s Cathedral? You will learn it during a 1 hour-long walking tour in the city (Slovak, English or German language tours or in other languages based on availability for min. 2 persons). The walking tour is free for Bratislava CARD holders. Walking tour of Bratislava focusing on the Slovak Easter traditions. Walking through the popular squares, courtyards and narrow lanes of the Old Town you will see significant historical sights. A stop at the Easter Market to get to know what is a unique about our Easter celebration, traditional meals, possibility to try to make your own Easter souvenir or at least to learn the technique. Booking required. Meeting time and place upon agreement.